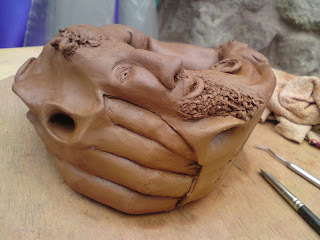 I like to let these pieces evolve, through the clay's natural reaction and in my mind. In this case it is particularly fitting since this torus is about the earth as a womb for evolution. Hopefully the continued evolution of all of its beautiful rocks, plants and creatures including its most capricious offspring - human beings! We live in unique times when we influence her gestation more than at any time before, let's ensure we do not force a still birth.